Sleeping Dogs box art is striking, bold in its black and white comic book look. I’m not a fan of the open world gameplay and worlds popularised by the GTA series. That’s what I tell myself, and here I am, enjoying the hell out of Sleeping Dogs, which is basically a by the numbers GTA clone. What’s going on here? In terms of structure and what you do, the games are nigh identical. You exist in the criminal underworld of a major city, drive around, do missions which involve beating up guys and driving, and look for hidden stuff in the open sandbox. But where I’m frustrated by GTA’s lack of direction, here I find it liberating. There’s three major components in play. One: where GTA is obsessed with American culture, Sleeping Dogs puts you in Hong Kong. I‘ve never been to Hong Kong, but I feel like I know the city. I’ve watched movies and especially played roleplaying games set in Hong Kong – Feng Shui’s HK movie fantasies are what first got me interested in the city and come to think of it, Asian culture in general. Being a life-long game master, I’ve gone through hundreds of articles, books, image collections and travel guides, getting as close to the city as I can without setting my foot there. Now, the city depicted here doesn’t feel as accurate or brilliantly realized as the New York of GTA IV does. But that’s not needed because it manages to convey a feeling that is unlike a Western city. Seeing the familiar names on the map, taking in the street ambiance, I feel like I’m a tourist in the city I always imagined. I’m eager to see what’s behind the corner and to learn the lay of the land. I imagine I would be infinitely more into GTA IV if I was more into New York, but that city just never interested me in the same way. Virtual tourism is a powerful force, but only if you want to be there. 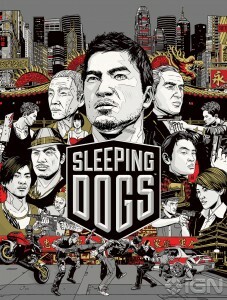 Two: Sleeping Dogs is a good game, whichever part of it you want to look at. The driving, shooting and especially fighting has always been dodgy in GTA, and here all of it works. The fighting is so good that I actually go out of my way to look for fights with hostile gang members. Their kung fu system is good enough to put you in the pants of Bruce Lee or Jet Li, ruthlessly putting down gangsters. It’s never a pushover, though, as you need to be careful with the wrestlers and the rare foe with a weapon. Something as simple as working controls is a huge thing in my enjoyment of a game and here Sleeping Dogs does everything right. It just feels good to play, at all times. Missions are never frustrating (so far) and checkpoints are sensibly placed. Three: the storytelling works because it’s about what you do. Whereas in GTA IV you have to lie to yourself to preserve the fiction while the gameplay undermines it, here what you do feeds straight into the fiction. You are a martial arts (movie) star who just beats up bad guys and shows off. You are an undercover cop with conflicting motives. The theme of being an undercover cop in Hong Kong is very powerful. The game doesn’t do a lot with it, but what’s here is enough to make me care. You’re doing missions for both the police and the gangsters, but also for the general public, as part of your image of a liked martial arts hero (and gangster). Just this double role brings a welcome tension to the drama. Bringing criminals to justice is new in this type of game. The relationship between the public and the gangsters is interesting. The fantasy of being a martial arts movie hero is also very powerful, reinforced by the martial arts school plotlines. It’s all strongly backed up by being in Hong Kong. You don’t handle guns all that much – I encountered my first gun some ten hours into the game, and even hand-held weapons are rare. Handling things with fists and generally just not killing people all the time feels fresh and helps preserve the fiction. So even though everything you do here is stuff I’ve done in other open world city sandboxes, here they work because the theme speaks to me, because the mechanics support the storytelling and vice-cersa, because they’ve differentiated by making you a (potentially) good guy, and because they’ve done their core job of delivering a good playing experience much better than might be expected. You don’t need a ton of new tricks, you just need your own voice. If you take away the love for Hong Kong, if you disregard the power of the themes, you would still have to say that it’s better than GTA at many of the core things.